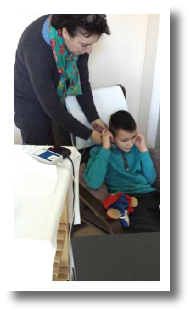 These practitioners provide training courses in multisensory stimulation techniques. In every case a better comfort of life appears. Through their enthusiasm and devotion, parents can help to improve their child’s quality of life and develop their potential by performing specific exercises with their child on a daily basis. can help to reduce the intensity of epileptic fits. For all children who need to be helped in their motor and/or cognitive development. in order to optimize his/her development and well-being. A specific therapeutic method for patients suffering from brain damage or spinal injury. Brucker-Biofeedback is a simple and non-intrusive reeducation method. Neuromuscular signals can be visualized on a computer screen. Electrodes are placed on specific muscle groups and their activity is measured. The patient can follow the activity on the screen and adapt the strength and precision of muscle contraction or relaxation. At term, the brain will register this new information and help the patient to adapt his muscle activity to the desired movement. Movements therefore become more automatic and this reduces the concentration effort necessary to move each muscle group. Trained in Miami by the Doctor BRUCKER, founder of this method, Ralf NICKEL assisted by Véronique de VROEY, currently works in a private hospital in Munich. They have been holding biofeedback work sessions since June 2015 in the premises of Association Dominique. It is a method of awakening the principle of which is the daily and adapted repetition of movements, games, exercises to wake and allow " the recording " of intellectual functions at a child who lost them or has not acquired them yet. Following this evaluation, a personalized program is set up and taught to the parents. The family is in the centre of the care and realizes this program at home. on the people affected by severe mental handicaps or by deep autism.